Now that your decorations are out of storage, your pictures of your everyday decor are taken and your towel is covering your couch, you’re ready for the next part. #1. 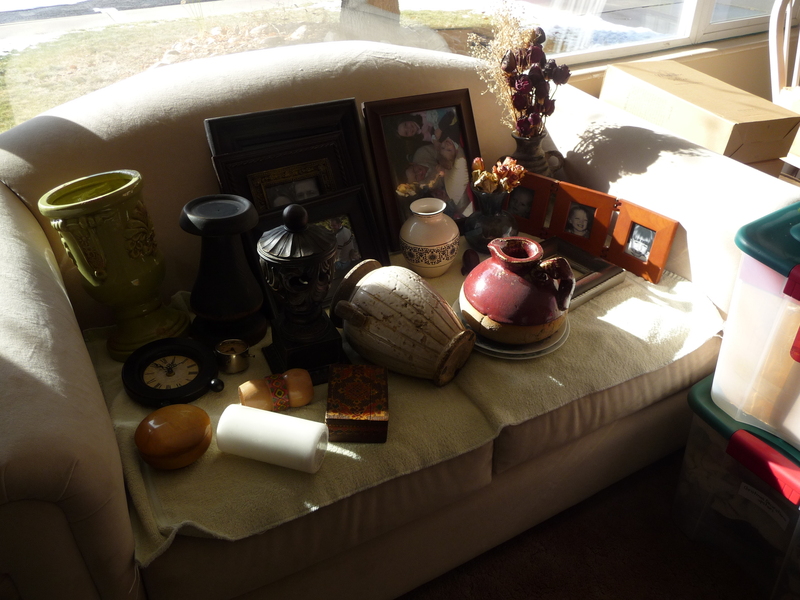 Take down your everyday decor and put them on your couch. By doing this it’s like having a blank canvas to work with and can make putting up your holiday decor much faster. Sorry for the bad picture. Harsh shadows. We don’t have any window treatments right now because we’re in the process of picking out new ones. Thus the harsh lighting. OK, this next step is a little time-consuming since it’s your 1st time, but it will save you tons of time later. Trust me on this and go with it. #2. Grab a piece of paper and a pen. As you take your decorations out of their box, write down what the item is. Use a separate piece of paper for each box. This is your inventory of what goes in the box. If you’ll notice at the top of my paper I even wrote down the washing instructions for my table runner. I did that because I cut the tags off so they wouldn’t show. Now it’s all in one place and I won’t have to remember how they need to be cleaned. And next year (hopefully), I’ll be typing up this list so it looks nicer. I mean, I did have a baby and all. Good enough excuse for me! But for now, it’s good enough. So this makes packing up your Christmas decor not only faster and easier, but it helps you not leave anything left out that your eye may have overlooked. I don’t know about you, but before I started doing this, I would forget to put something in the box and then in January when all my boxes were packed and shoved into the darkest corners of our “garage” (our laundry room), I would discover that I still had an item or two out. But I wouldn’t want to go through all the effort of pulling the boxes out just to put 1 thing away. So that Christmas item would sit on my washer or dryer for an entire year until Christmas came around again. I hated that. But obviously not enough to pull my boxes out. Another reason I have an inventory is because each one of my boxes are very tightly packed. It’s a lot easier to figure out how to fit the contents of 1 box back into the box than trying to take all my decorations at once and try to fit them in different boxes. Did that sentence make any sense at all? Yeah, not to me either. Email me with questions. So make your inventory list. You’ll thank me later. 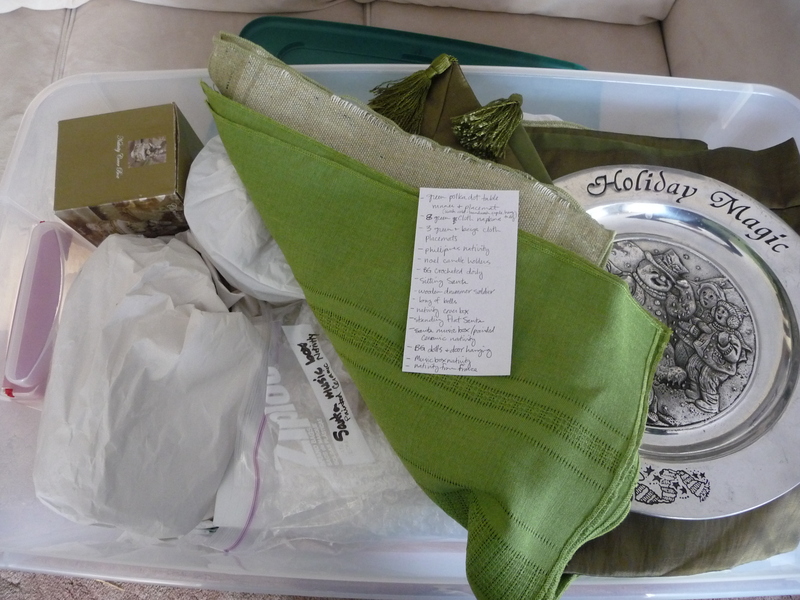 This entry was posted in Holidays, Organizing and tagged Christmas, decorations, inventory list. Bookmark the permalink.